An eye-catching proposal for a pair of interlinked skyscrapers that would have reshaped Portland’s skyline won’t be realized after all. While renderings of the twin towers from William Kaven Architecture (WKA) captured the internet’s attention when they were released earlier last month, economic redevelopment agency Prosper Portland’s three chosen finalists for the downtown post office site leaves the towers off their list. Prosper Portland was seeking to fill a 32-acre hole in the fabric of Portland’s Pearl District, as well as redevelop the 14-acre Postal Service headquarters site within, which will soon sit empty. 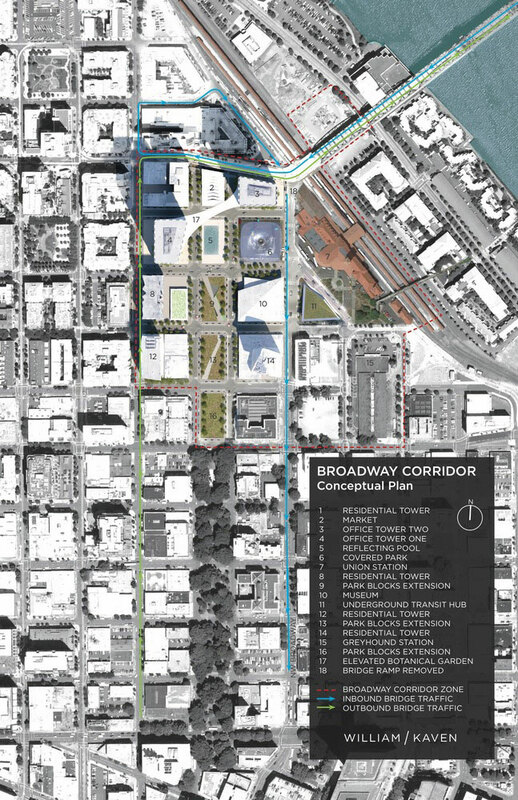 In the agency’s RFQ, the project is pitched as the “Broadway Corridor” which would link Chinatown to the Pearl District, and the winning developer would be given the right to purchase the land before enacting any redevelopment. 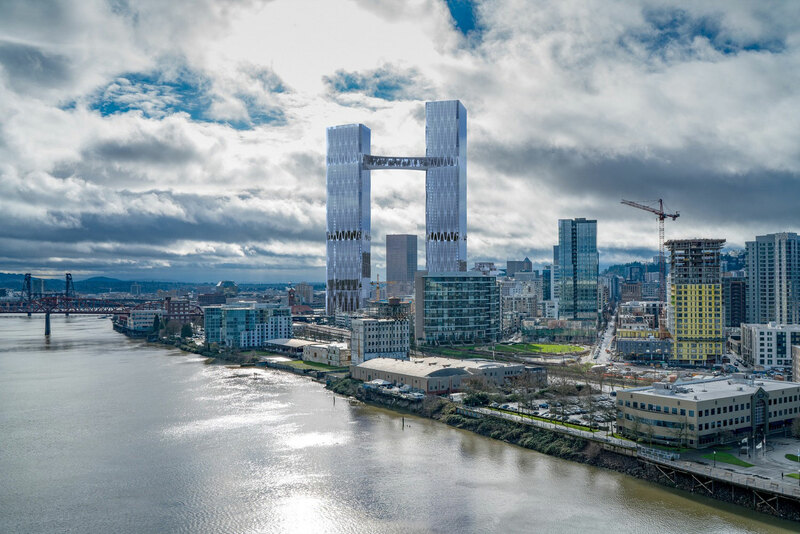 Although Prosper Portland had only asked interested firms to submit their qualifications, not full proposals, Portland-based WKA responded with plans for two towers, one of which topped out at 970 feet, linked with high-flying skybridge. The plan was pitched as a potential tourist attraction, and in an Op-Ed for DJC Oregon, WKA principal Daniel Kaven defended the grandiose scheme as necessary for pushing Portland into the 21st century. Instead, Prosper Portland, who purchased the site for $88 million with the intention of turning it into a mixed-use hub, has chosen Denver-based developer McWhinney, the San Francisco-based office of Related Companies, and Denver developer Continuum Partners. WKA’s proposal would have brought 5 million square feet of developable space to the site and included condos, apartments, hotel rooms, offices and retail space, though whatever eventually lands there will likely be more subdued. It’s expected that the final plan will include around 500 units of city-owned public housing and 2,000 private units, with 10 percent set aside for low-income residents. The next step for the three finalists will be a presentation to the public on their plans on March 21 at 5:00 PM, at Leftbank Annex, 101 N. Weidler St. in Portland.